I didn't post a blog on here for quite a long time with my last one being way back in October of 2011. Today however that changes, and I have finally put some time to start blogging here again. Squaresville is Mini-series that kind of gives a similar vibe to something like Freeks and Geeks.The writer of the show Matt Enlow sums up the series pretty well in the following quote: "The adventures of two suburban misfit teens, as they struggle to remain best friends, grow up, and make the world a little better. "I came to watching this series through a recommendation by a friend of mine and it grew on me quickly. I really love it's characters in addition to the direction it seems to be taking going forward. Squaresville is still pretty small so if you guys like it spread it around! Either ways be sure to check the first episode out ! 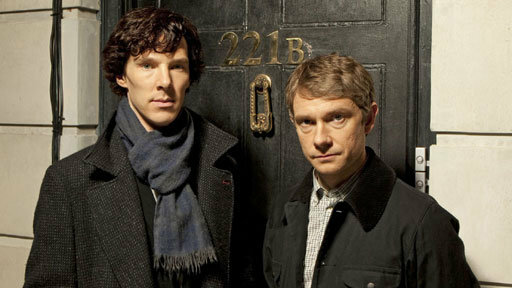 I think I've watched Sherlock around 3 or 4 times already and I still can't get enough of how awesome it is. I'm a big Holmes fan, read all the novels and short stories, and I gotta say that this adaptation of Sherlock Holmes is the best I have ever seen. Benedict Cumberbatch is the best Sherlock there is! I don't speak German but this song has been stuck in my head for quite a while now. I first heard it from the FIFA 12 soundtrack , and I've been listing to it ever since. To top that off , the band actually sounds awesome live. Point and clicks are not that popular in the gaming world as they were before, but that doesn't stop them from being so awesome. The Journey Down is a recently released point and click game that is throwback to the classic lucasarts stuff. It has a really cool artstyle and a funny cast of characters. Check the trailer out above! The first Torchlight was labeled off mostly as a "poor Man's Diablo", but I still had tons of fun playing it. Torchlight 2 however is coming up soon and from what I tried from the beta it is looking up to be leaps and bounds ahead of the first one. It has both LAN and Online Co-op, and they fixed and improved a ton of things from the first torchlight. Don't throw it off as a Diablo rip-off! Hopefully this post amused you to say the least. Until next time! Similar stuff you might want to take a look into includes Samy Deluxe, Seed & Peter Fox. Great, thanks for the recommendation r.Evo! Will check those out . EDIT: I played torchlight one as well and enjoye it, but it would be foolish to deny that the game was at least "heaviliy inspired" by the diable franchise. Yep totally, no one is denying that. I mean it was made by ex-blizzard employees. I already pre-purchased it on steam, hopefully it gets released this month!